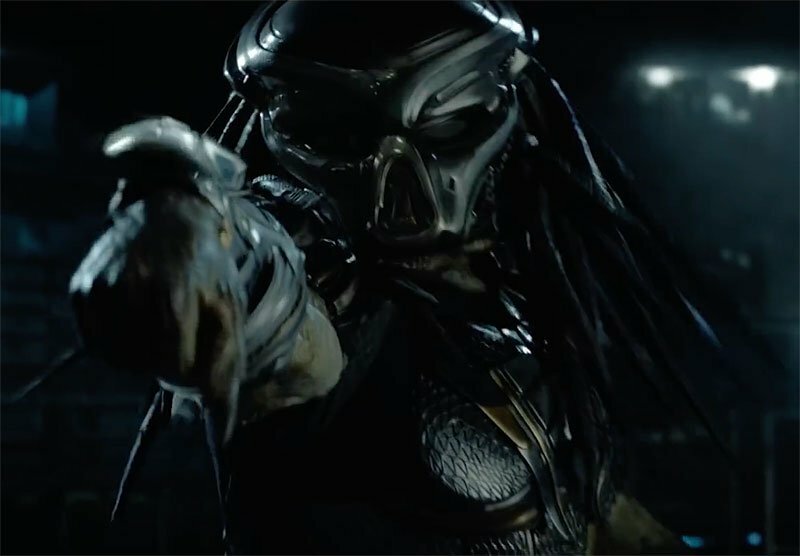 ComingSoon.net Visits the Set of Shane Black’s The Predator! April 2017: We arrive at the studio in Burnaby, Vancouver on day 34 of 66 for 20th Century Fox and director Shane Black’s The Predator. The crew, including noted director of photography Larry Fong (Super 8, Watchmen), is setting up an action scene set near a baseball diamond. 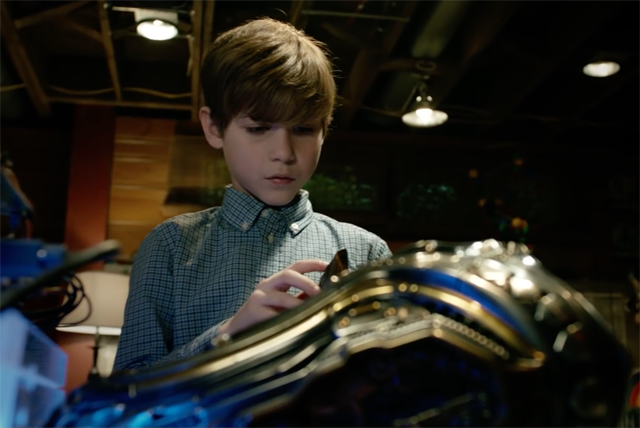 We’re seeing the back of the young Jacob Tremblay’s Rory, who is wearing some kind of strange metallic Predator glove and being chased by a dog, first a real pit bull and then… a Predator dog, and not the kind you know. 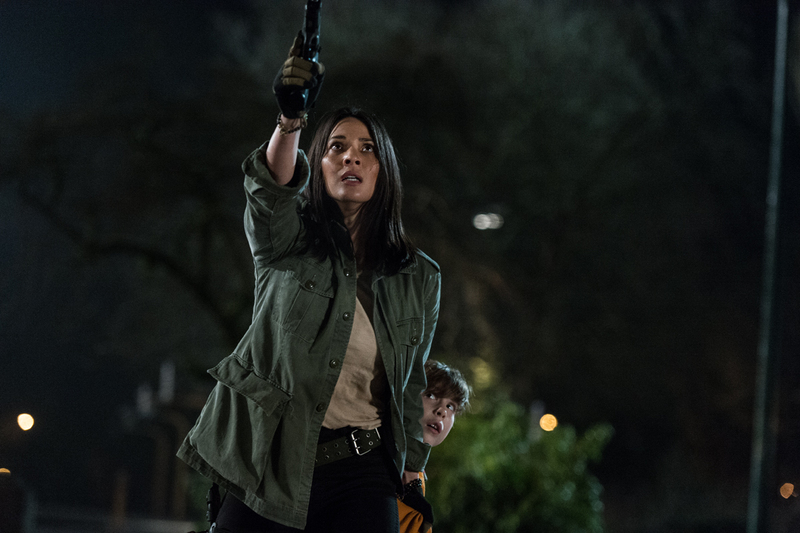 Tremblay runs towards Boyd Holbrook and Olivia Munn, who are stationed behind a car, as they help ward off the pack of alien hounds. A true sequel rather than a reboot, The Predator is set in present day, 30 years after the events of the first Predator from 1987 that starred Arnold Schwarzenegger and… Shane Black! Although Black’s wisecracking mercenary Hawkins was dispatched fairly quickly in the original, the writer/director never lost his fondness for the franchise, and always saw potential in it, even proclaiming on DVD extras shot in the early 2000s that there was “still gas in the tank” for the series. Now the filmmaker behind The Nice Guys and Iron Man 3 has reunited with his old Monster Squad co-writer and pal Fred Dekker (the duo were known affectionately as “Black & Dekker”) to revitalize the series, which also included the LA-set Predator 2 in 1990, the off-world 2010 sequel Predators, as well as the two less distinguished Alien vs Predator films. Despite getting to see some shooting during our set visit, including the aforementioned Predator canines, a massive alien spaceship set and a costume trailer full of old school practical Predator outfits, much of the plot remains a mystery. That mystery continues even after the more recent release of a cryptic teaser trailer, although in talking to Black and the cast we are able to piece together some of the new film’s plot. 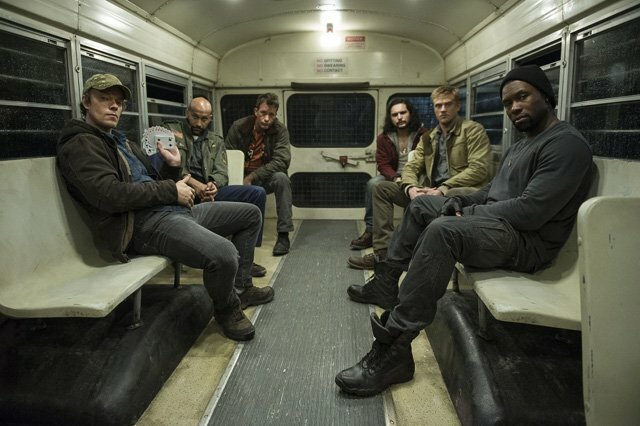 This “bunch of bozos” Holbrook is referring to are The Loonies, as played by Thomas Jane (The Punisher), Keegan-Michael Key (Keanu), Alfie Allen (Game of Thrones), Trevante Rhodes (Moonlight) and Augusto Aguilera (Chasing Life). 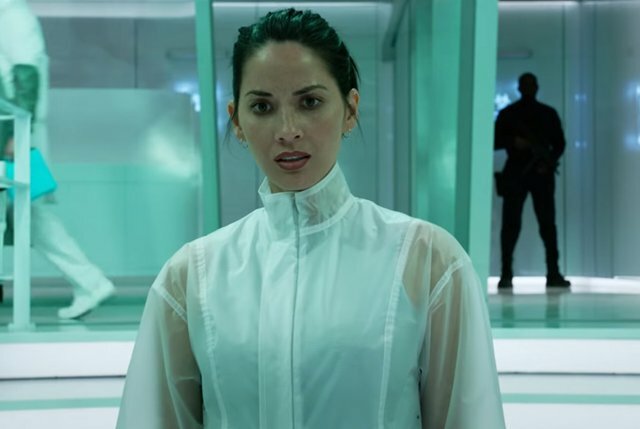 The two anachronisms in our group of high-testosterone heroes facing off against the alien threat are Olivia Munn (X-Men: Apocalypse) as an evolutionary biologist, and 11-year-old Jacob Tremblay (Room) as Boyd Holbrook’s estranged son. While early reports pegged The Predator‘s story taking place primarily in the suburbs, that’s a bit of a misstatement. There are scenes set in Rory’s neighborhood, particularly at Lawrence A. Gordon Middle School (named after longtime franchise producer Larry Gordon), which seems to be in the same bluescreen grassy field area where they’re shooting today in the studio. One shot shows Tremblay hyperventilating as the camera moves around him to focus on something that will be added later. It might have something to do with the Predator dog reference statues on set. At the end of a new take headlights show up signaling the arrival of some saviors. Holbrook is firing a machine gun to protect Tremblay from the Predator dogs. He runs out of ammo and then Munn steps in and carries Tremblay away. After the first take the pit bull used in the previous scene barks through the take. The stand-in reference Predator dogs are made of blue foam, and the bottom jaw is similar to the Predator mouth but with a large maw lined with shark-like teeth. There’s a new shot of Holbrook getting out of the car and wrangling with one of the dogs, who is trying to chew on his machine gun. Jacob has the ability to understand the Predator language because of his autism, which explains his strange hand motions during this scene. “Hey buddy, are you alright?” asks Holbrook. “He’s estranged from his wife, he’s detached from his son, and I think the heart of the story is about reconnecting, being father to a son and getting all these loony toon guys who have no direction and give them a sense of purpose,” said Holbrook of his character’s motivation in the film. The main Predator in the film is played by 6’9″ Bryan Prince, a parkour artist. We enter the costume van where we see the Predator costume made out of a lightweight foam. 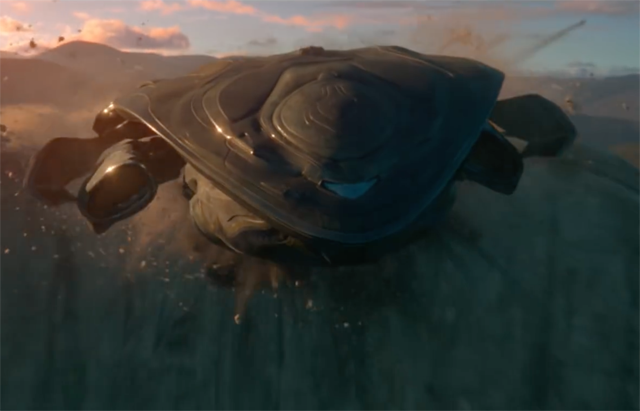 There’s also armor with a lot of battle damage that it obtains over the course of the film. He will also wear a space suit aboard his ship. His face and body is still the same iconic one designed by Stan Winston 30 years ago, with the dreads, the mesh, etc. Production also added a very samurai-esque back flap to the costume. Tom Woodruff Jr. and Alec Gillis of the Alien vs Predator series are once again providing the Predators this time out. We then head to the big science facility set, which is composed of big Brutalist slabs of sharp-angled concrete. It’s a massive set with high ceilings. Meanwhile the Predator spaceship set is still being carved out of Styrofoam. It is curvaceous, dark and even has dreadlock connecting cables. The inside of it is 80-feet by 40-feet, and the outside is 100-feet wide. It’s a space meant for 8-foot-tall beings. The shoot scheduled for this ship will take 7 days out of the company’s schedule, which indicates a major set piece will take place here. Also sitting around the massive studio space are a full-size purple chopper on a crane, a jungle environment, a bunker, a rocky environment. The Predator has all the earmarks of being a huge event film, which is exactly what Shane Black set out to make. Our set visit ends with a bang, literally. The crew sets up for another take in front of the blue screened baseball green with Augusto, Tom and Keegan, machine guns at the ready. They begin blasting away, loudly, until their machine gun clips are empty and they switch to pistols. “Watch your f**kin brass, man!” Key’s character yells at Aguilera. “I love what A camera is doing,” Black yells through a bullhorn. As for the iconic Predator himself, who knows what lies in store once The Predator hits theaters on September 14. The post ComingSoon.net Visits the Set of Shane Black’s The Predator! appeared first on ComingSoon.net.